Queensland and sport go hand-in-hand, so sportswear seems a natural place to start when thinking about the influence of Art Deco sensibilities on local women’s fashion. Across the Western world, the 1920s saw a boom in women’s sporting participation, linked to their increasing visibility in public life and newfound sense of independence. Fashion in general embodied these new values, observed in the abandonment of corsets, rising hemlines and simplified designs. Sportswear was no exception. What follows are a few Queensland images from the 1920s showing the influence of modern fashion on what local women wore to play sport. Even more than that, they show the 1920s as a period of rapid social and cultural change in Queensland – what was considered appropriate attire in the early 1920s had evolved into something quite different by the close of the decade. Let’s begin with tennis as a case study, a sport deemed suitable for women’s participation from the late 1800s. 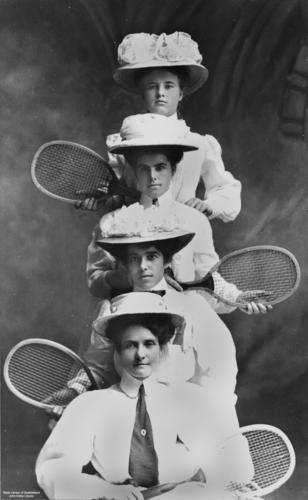 To set the scene, this first image of the Queensland Ladies Interstate Tennis Team from 1908 illustrates the kinds of physical restrictions women contended with prior to the arrival of modernity. As a Queensland representative team it could be assumed these women were among the more serious and adept players of the game, yet their movement would have been severely restricted by their Edwardian ankle-length skirts, narrow waistbands, long-sleeved blouses, ties and broad-brimmed hats. By the 1920s, things had started to change. This illustration appearing in The Queenslander in 1921 shows the strong influence of modern fashion on what was considered appropriate tennis attire – the dress is slimline and drop-waisted in accordance with the androgynous or ‘beanpole’ style that came to define the decade. Importantly, looser fitting dresses, slightly higher hemlines sitting above ankle-length and less cumbersome hats all combined to allow women freer athletic movement. It seems unlikely anyone would have seriously attempted to play sport in the kind of heeled shoes shown here, but they served as a visual reminder to women to maintain their femininity even in the throes of an exhilarating tennis match. However, this isn’t where things ended for tennis attire in the 1920s. 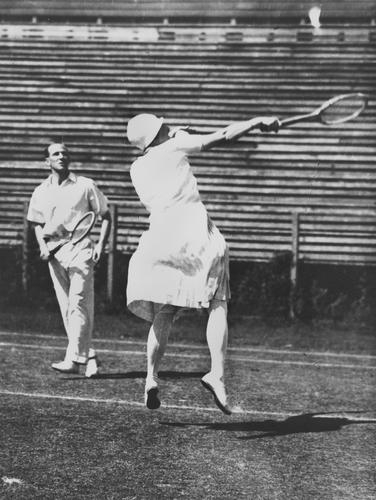 The woman in this next photo from a mixed doubles match in Brisbane in 1927 sports an even less structured dress with a substantially higher hemline and short sleeves – all changes that brought still greater mobility. Indeed, this is a woman who embodies modern values – she is physical, strong, in flight and free … not to mention playing alongside a man. Here’s another interesting (albeit faded) photo from Rockhampton paper, The Capricornian, highlighting the shift in sporting attire for javelin throwers between 1912 (R) and 1928 (L). Leg-revealing shorts had entered the scene of women’s athletic wear and this evolution in modern fashion radically changed the energy and physicality with which women could participate in their chosen sport. While the location of this photo is unknown and may have been taken outside Queensland, its inclusion in the paper suggests it would have resonated with readers locally. 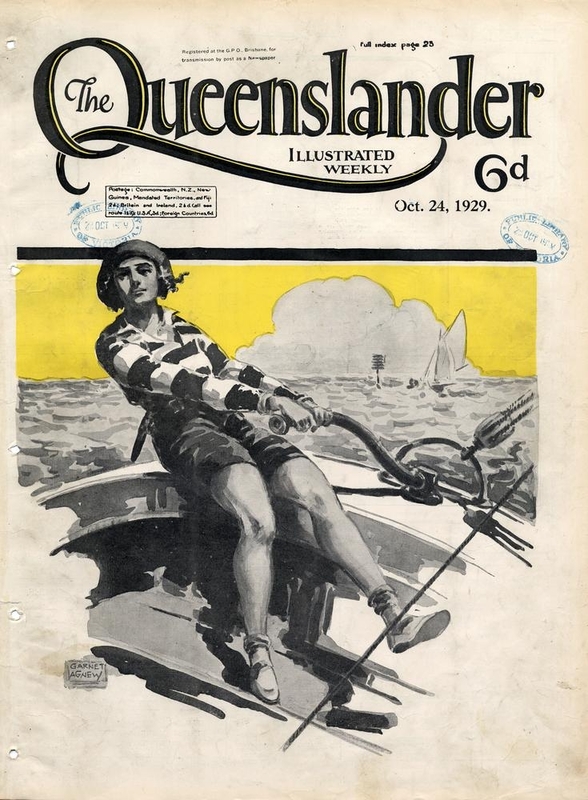 Talking of shorts, this image from the cover of a 1928 edition of The Queenslander by local illustrator and cartoonist Garnet Agnew (1886-1951) is not only evocative of Queensland beach culture in which sailing featured as a popular sport, but also epitomises the changes in women’s fashion and mobility we have traced from the early to late part of the 1920s. Note the foot she lifts towards us, showing off her functional, modern sports shoes. Given we started by looking at a Queensland women’s sporting team, let’s end with another – this time the Toowoomba Ladies Cricket Team from 1928. Uniforms had certainly changed in the intervening two decades, with these women casting off the long dresses of yesteryear to sport ‘boyish’ v-neck pullovers and trousers that matched their modern outlook. Women should never forget that they are women, on whom nature has imposed certain restrictions. However, many women were beginning to realise it was culture rather than nature that had imposed such restrictions, and as we have seen, started demanding different types of clothing that would support their newfound athleticism. Fashion thus became a central part of constructing the ‘modern woman’ in Queensland. Queensland Ladies Interstate Tennis Team, 1908. Courtesy of State Library of Queensland. Mixed Doubles Tennis Match in Brisbane, ca. 1927. Courtesy of State Library of Queensland. The Queenslander front cover, 24 October 1929. Courtesy of State Library of Queensland. 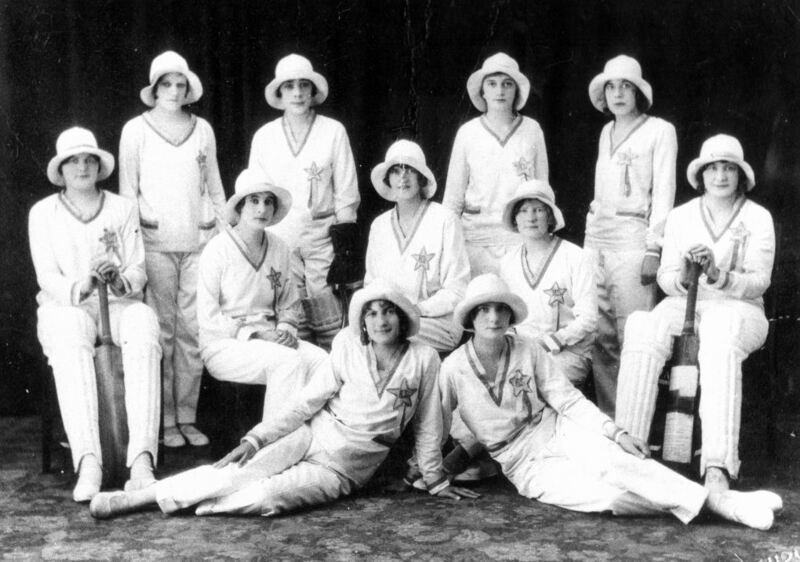 Ladies Cricket Team, Toowoomba, Queensland, 1928. Courtesy of Local History and Robinson Collections, Toowoomba City Library. This photo may not be reproduced without permission of Toowoomba City Library. Remaining images are drawn from the newspaper references below. ‘Contrast in Women’s Sports Wear.’ The Capricornian. 13 September 1928, p.8S. ‘Household Pictorial Page.’ The Queenslander. 15 January 1921, p.4. Howell, Max, Reet Howell and David W. Brown. The Sporting Image: A Pictorial History of Queenslanders at Play. University of Queensland Press, St Lucia, 1989. Skillen, Fiona. ‘It’s possible to play the game marvellously and at the same time look pretty and be perfectly fit: Sport, Women and Fashion in Interwar Britain.’ Costume, Volume 46, Number 2, 2012, p.165-179. ‘Too Strenuous. Women’s Sports Can Be Overdone.’ Morning Bulletin. 28 May 1928, p.4. What an interesting article on sports clothing for women during this art deco period. Excellent illustrations covering a lot of ground.